SS. Cyril and Methodius National Library in Sofia, the capital of Bulgaria. Monica Vaklinova photos. Sofia is a modern city, a capital, and a real historical treasure. Sofia is not only the capital city of the amazingly beautiful Bulgaria, it is also one of the most captivating places from among the European cities. Boyana Waterfall outside of Sofia, Bulgaria. With a population of over 1,307,376 people, Sofia’s rich history makes it even more interesting for visitors from all around the world. There is a lot to see, a lot to visit and a lot to taste. This city is one of the most underrated places in Europe but, trust me, it is a hidden treasure. I live here and am happy to share my city with you. 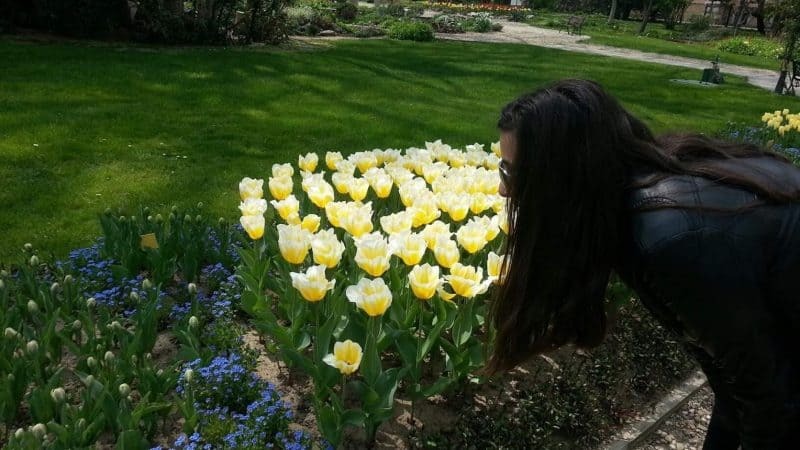 Blooming tulips at Botanical garden in Sofia. The three words, which can describe Sofia are churches, beauty, and history. All these beautiful creations are around the city center. You should not miss the gorgeous and fascinating Cathedral Saint Alexander Nevski. This is a sacred place for all of Sofia’s citizens. This church is best-known for being the largest Orthodox cathedral in Europe and it is really impressive. The cathedral is made with luxurious materials including gold, marble, and onyx. 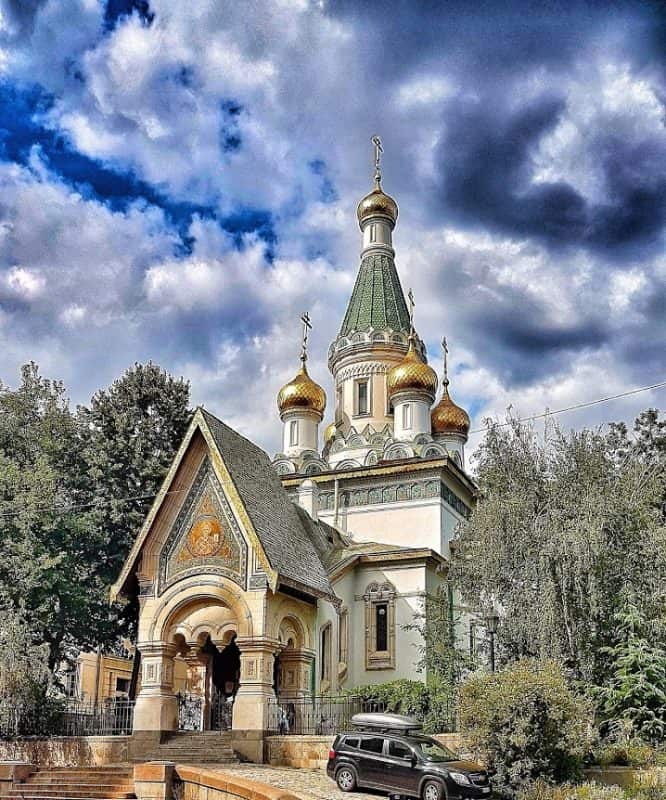 Another must see treasure in the city is Saint Nikola’s Russian Church. This church has a captivating story hidden in it. People mainly go there to write open hearted letters to Saint Nikola, praying for his help. They also bring flowers in return for Saint Nikola’s help. The architectural monument in the heart of Sofia, called Church of Saint George is a great and unique historical place and one of the main symbols of the capital. It is actually an interesting red brick rotunda and it is thought to be the oldest building in the city. Built in the 4th century by the Romans and restored a few years ago it is captivating building with substantial history. Other beautiful churches, which deserve to be seen are Boyana Church, Saint Sofia Church, and Sveta Nedelya Church. You will be fascinated by the pure and magical beauty of these exceptional and outstanding churches in Sofia. 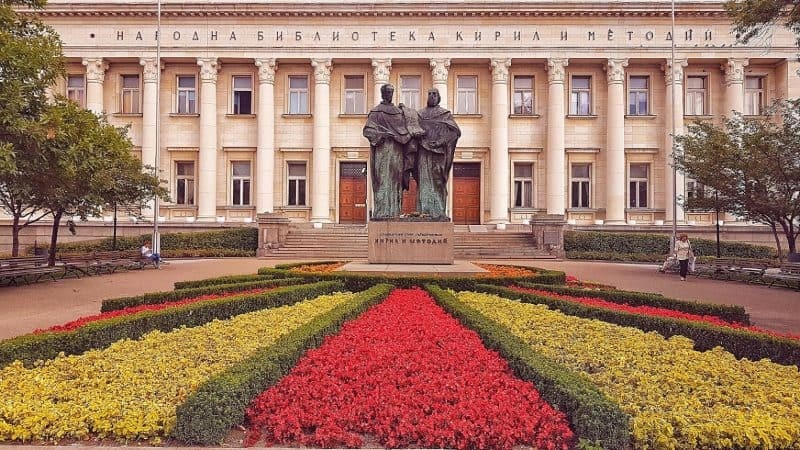 One of the most famous marks of the capital city Sofia is the National Palace of Culture, which is located in the perfect center. This is not only the pure heart of Sofia but also the city’s largest multifunctional conference and exhibition center. It is well-known in Europe. Built in the not so distant 1981, this magnificent palace is a host to many different, interesting events such as colorful exhibitions, film festivals, working conferences, shows and fairs. It also has a beautiful and tranquil view. There is a huge and alluring park with fountains in front of the building. Many local people go there after work to meet with friends and enjoy the beauty of the building and nature surrounding the palace. National Palace of Culture in Sofia. Vitosha Mountain is in the surrounding area of the city. It is the perfect place for those, who love adventure, hiking and ravishing nature. There is a lot to see in this beautiful mountain, but you should definitely see the divine Boyana waterfall. It is pure magic. You can only access it by foot after 3 kilometers of hiking, but don’t be scared because you are going to be surrounded by fascinating nature and fresh air. It is absolutely worth it. 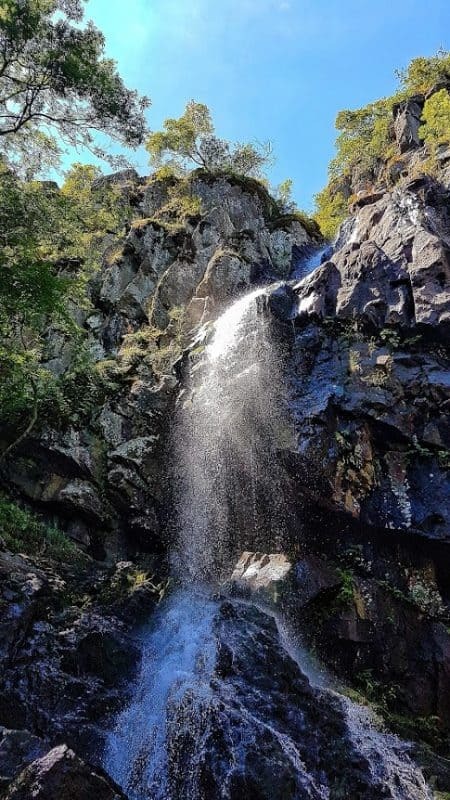 The Boyana Waterfall is the largest waterfall on Vitosha Mountain. Although it is a popular spot not only for tourists and locals, it is a calm place and it would definitely bring you peace. It is the perfect spot for the long and hot days during the summer season. The Boyana waterfall is truly breathtaking. 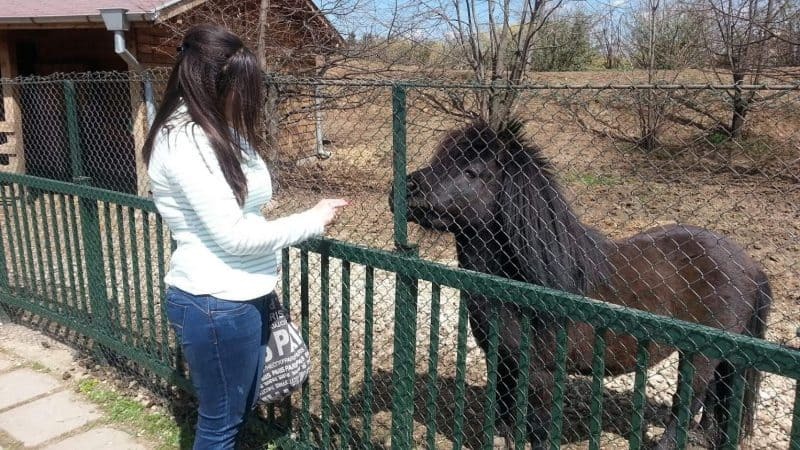 Black pony in the Sofia Zoo Garden in Bulgaria. Sofia has something for everyone. If you love flowers, natural and calm atmosphere and sweet scent, you should definitely visit the University Botanic Garden. My first time there was so memorable. I was absolutely amazed by the beauty of the garden. The Botanic Garden is located in the heart of the capital city, but you will find yourself in a different dimension there. You will be in the city, but in the same time, you will be far away from the busy life and the noisy city. Be sure to see the magical open garden and the glasshouse garden, which is full of roses, palms, and other magnificent flowers. In the open garden, there are benches everywhere and you can sit and think surrounded by beautiful creations of nature. The rich collection of the garden contains over than 1500 species. Established by Stefan Georgiev in 1892 it is the perfect mixture of beauty, color, and scent. Another great attraction in the city for the animal lovers is the Zoo Garden. It is also the ideal place for families with children. Children adore animals. Founded in 1888, it is the largest zoo garden in southeastern Europe. This incredible place is home for many different animals. It contains 4500 animals and 840 different species. You can easily access the zoo garden by public transport because it is located in the downtown. Go there and give all your precious love to the animals because they need it! SS. Cyril and Methodius National Library was established in 1878. It is a beautiful place with an exceptional building and magnificent gardens in front of the building. The library is named after Saints Cyril and Methodius, who are the creators of the Glagolitic alphabet. This is also the biggest library in Bulgaria. There are 7,808,928 books in it. It is the perfect place for bookworms, who are drugged by the smell of old books. National Theatre Ivan Vazov in Sofia, Bulgaria. 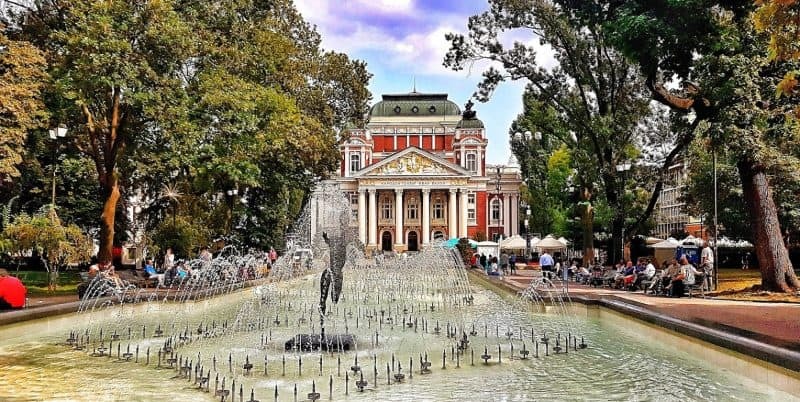 Ivan Vazov National Theatre is located in the heart of Sofia too. It is one of the most important and trademarks of the city. It is a must see place to visit. You can fall in love with the architecture of the building. Even though it is established in 1908, it is one of the best looking buildings around the city. There you can watch all of the finest Bulgarian actors perform. Their amazing staging production can absolutely make you laugh at first and then in the next second, you may find yourself crying like a baby. It is a fascinating feeling. In front of the building of the theatre, you can also find a really beautiful garden with a nice fountain. People go there all of the time, especially at night, when it is beautiful with the lights on. I can describe it with two simple words – impressive and beautiful. Sofia is not only a busy city. There are a lot of gardens and parks all around the city center, which offer an incredible nature and a variety of attractions. South Park is one of the main favorite spots for many people. You can take a long walk, ride a bike, do some exercises, lie on the green grass, have a picnic. If you are not so active, you can just enjoy the nature or go for coffee or to grab a meal at some of the nice restaurants in the area of the park. 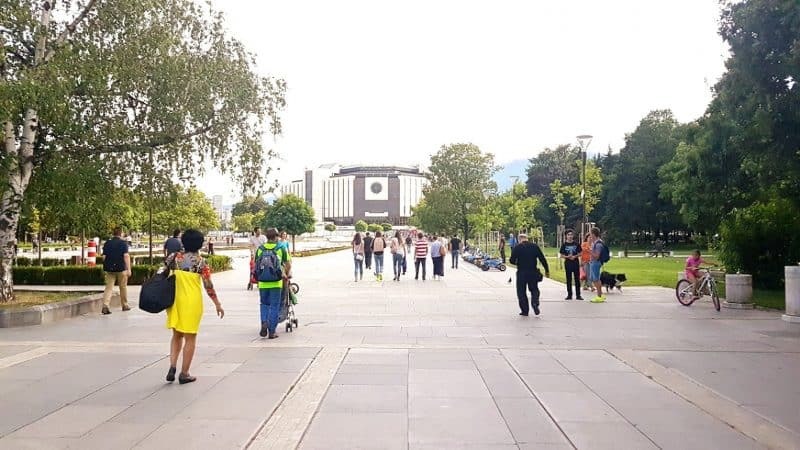 The perfect location connects the park with Sofia’s most popular shopping boulevard Vitosha. Another place for relaxation is the Borisova Garden. It is known as the oldest park in Sofia. The park is full of sculptures of famous Bulgarian people. You can literally find them anywhere around the garden. Ariana Lake is located on one of the sides of the Borisova Garden. It is perfect both in the summer and the winter. Go for a ride with water wheel in the summer and fresh yourself in the long hot days or go ice-skating in the winter and take a part in a magical winter fairy tale. When you’re in Sofia, be sure to taste banitsa! You can eat almost anywhere for a decent amount of money. There are some traditional dishes you have to try because you won’t find them in any other country in the world. Bulgarian food is fresh and tasty. One of the main this to try is the delicious greasy pastry called ‘’banitsa”. You can find this sensation in every bakery around the town. It is filled with cheese, but there are also many variations of the dish, which contains spinach, pumpkin or cabbage. It also could be found with sweet filling – with apple, with Turkish delight or pumpkin. The price of ‘’banitsa’’ varies from 1.00 to 1.50 BGN (around 0.70 Euro). For the fans of healthy eating and the salad lovers, Bulgarians have a simple salad called ‘’shopska”. It contains cucumber, tomato, onion, pepper, cheese, and parsley. The price goes from 3.00 to 5.00 BGN (1.50 – 2.50 Euro). ‘’Musaka” is the goddess of all the traditional dishes in Bulgaria. It involves potatoes, eggs, and minced pork meat. There is even a joke amongst the Bulgarians, which says that if the woman can’t cook ‘’musaka” she isn’t ready for men. The price is the same like for the salad, inexpensive and widely available. ‘’Tarator” is a refreshing yogurt-based soup with cucumbers, dill, garlic, and walnuts. It is best when it is cold and it’s perfect for the summer season. The price is around 2.00 BGN (1.00 Euro). Be sure to try also and the grill in Sofia. Bulgarian people are crazy famous with their grill specialty, called ‘’kebapche’’. The price goes around 2.00BGN (1 Euro). Monica Vaklinova, 27 is from Sofia, Bulgaria. She works in the Sofia airport in the security section as a supervisor. She is passionate about traveling and writing and has been in almost every country in Europe. She is a freelance writer in her spare time and loves expressing my traveling emotions through writing.